This school year, my younger daughter's teacher started doing yoga with her students every morning. The kids love it because it's fun, and the teacher has seen huge improvements in the students' behavior, attitudes, and moods. I'm amazed at the benefits these blossoming yogis gain! Seven particularly helpful benefits illustrate why yoga is wonderful for kids. My girls love sports, and I can tell that my younger daughter is more coordinated and flexible this year. I think that's because of yoga, which increases strength, balance, flexibility, coordination, and spatial awareness. But what if your child doesn't enjoy physical activities or participate in organized sports? Yoga gives them a gentle way to stay physically active and keep moving. In the midst of life's busyness, school pressures, and other challenges, our kids can feel intense stress. Yoga provides the perfect escape. Not only does it promote inner harmony, but the movement also releases tension and increases feelings of well-being, making yoga an ideal everyday activity for kids. While I've noticed an improvement in my daughter's coordination since she started yoga, I also found out that it helps kids develop dexterity and motor skills. They also gain a greater awareness of how their bodies move and function as individual muscles, bones, and joints and as one unit. This body awareness and appreciation can motivate kids to make healthy choices that protect their body and ensure that it functions properly now and into the future. Every time my daughter meets a milestone in yoga, like beating her balance record or mastering a new pose, her face lights up. I love to see her confidence grow! I also appreciate that she puts the confidence, self-esteem, perseverance, and patience she gains from yoga into practice during everyday life at school, with friends, and during social activities. Mastering yoga moves requires incredible focus and concentration. Kids must clear their minds and focus their attention on bending and twisting their bodies into position. This practice on the yoga mat transfers into the classroom and every arena of daily life. Our kids can get better grades in school and quiet their minds in a variety of situations because they learned to focus and concentrate while doing yoga. Therapists often suggest that patients with anxiety, anger, or fear should focus on controlling their breathing. This exercise quiets negative thoughts, calms strong emotions, and gives the person time to think. 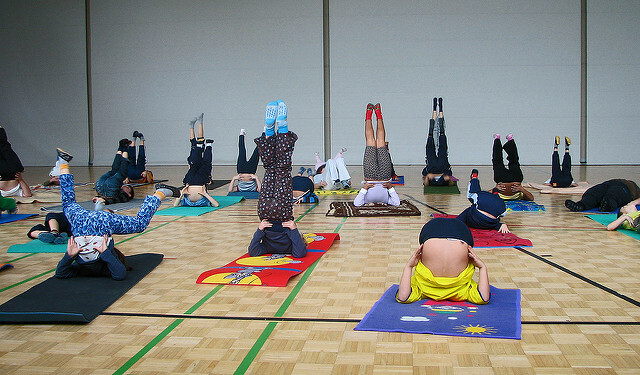 Yoga does the same thing for kids. They can use the skills they learn from yoga to regulate their bodies, minds, and emotions throughout the day. Yoga is filled with nature references. Whether our kids do an animal pose like the mouse, lion, or dog or a nature pose like the tree, sun, or mountain, they are connecting with nature and gaining a greater appreciation for the environment and the role they play in the world. Yoga has definitely given my daughter these seven benefits and more. I highly recommend that all kids become blossoming yogis. How could your child benefit from yoga?